ON BILLBOARD CHARTS TWICE IN ONE WEEK! NEW PRAGUE, MN - 2014 is proving to be a remarkable year for The O'Neill Brothers, as two of their albums have hit Billboard's New Age Chart multiple times and both of them together most recently as August 30th. 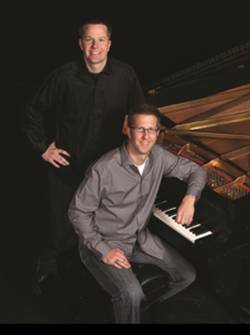 Both CDs, Piano Favorites and Inspirational Piano are compilations of their famous relaxing piano songs, such as "Over the Rainbow," "Unchained Melody," "Amazing Grace" and "How Great Thou Art". These multi-million selling recording artists from New Prague, MN have come a long way from recording their first cassette 20 years ago. "Piano for Someone You Love," was nominated for an Emmy award, and their wedding CD 'A Day to Remember' is the #1 wedding CD in the USA.